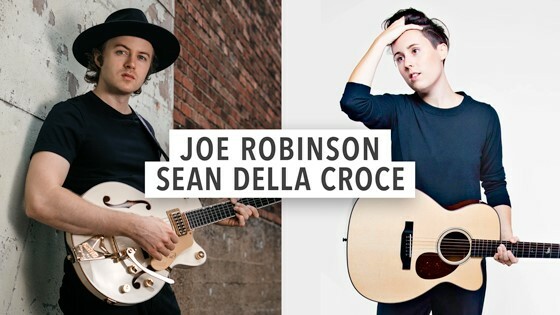 Joe Robinson and Sean Della Croce first crossed paths at “Guitar Town,” a hugely successful festival held each year in Copper Mountain, CO. They have created a lasting friendship that has allowed them to collaborate musically over the years as duet partners and co-writers. This time they will share the bill as they unveil their latest album projects. Born in the backwoods of Temagog, on the mid-north coast of New South Wales, Australia, his six-string ability and compositional insight have already earned him a worldwide following. Robinson has spent many years touring North America and abroad (China, Japan, Europe, and Australia) playing festivals and headlining clubs, which has enabled him to define himself as a budding world visionary, displaying his virtuosity on electric as well as acoustic guitar. This ultra-talented 27-year-old’s unique musical sensibility, thoroughly modern guitar tones, and tenor voice are at the core of the self-penned songs about communication and self-realization found on new album Undertones. In addition to touring on his own, Robinson has been hitting the road with Rodney Crowell, Tommy Emmanuel, and Guitar Army, which features fellow master guitarists/singers/songwriters John Jorgenson and Lee Roy Parnell. SEAN DELLA CROCE is a songwriter with a voice powerfully tuned to every story she tells. Her latest album, Illuminations, is set for release this spring. A Nashville native, Della Croce grew up steeped in the city’s culture and learned her craft by the light of some of music’s biggest stars. She is the third generation of her family with the music business in her blood, growing up around such influential artists as Vince Gill, John Oates, Ralph Stanley, the Beach Boys and Leann Rimes. Such familiarity enabled her to absorb a wide-range of song craft and musical styles without being swept up by the larger-than-life personalities. Della Croce has forged a style all her own with her latest project. Illuminations is a blend of folk wisdom with Americana heart and a truly alternative soul. The record is rooted first and foremost in Della Croce’s poetic lyrics-the ten track album is comprised entirely of original songs. Her light-touch fingerstyle guitar playing shows flashes of influence from her late step-father, the well-known guitarist Pete Huttlinger.